It was over, the dream, the desire, the hopes that they'd become more. Rico Terriot was a luxury she couldn't afford. Amber stood panting in the center of her kitchen, her sense of security torn away by a single, paralyzing fact - they were still looking. The call on Evie’s phone . . . was it the first of many escalating threats warning her to keep her mouth shut . . . or else, putting Rico in greater danger by mere association? They’d have to leave New Orleans. The time to plan for a quick escape started now, this minute, ticking down toward what could be their last. If they didn’t disappear, both her and Evangeline, they’d be as good as dead. Again, the thought flashed through heart and mind to go to Rico, that he’d get them out of the city if she asked, but she couldn’t involve him, not while he was within reach of those who meant her harm and wrapped up in his own intrigues. If she ran without explanation, he’d follow - she knew he would - so she’d have to make sure he wouldn’t want to. Survivor’s instincts that had kept her alive and Evie safe kicked into place, setting in motion the pattern of cool, sharp, unemotional thought that would carry them away from harm . . . and all they’d ever desired. 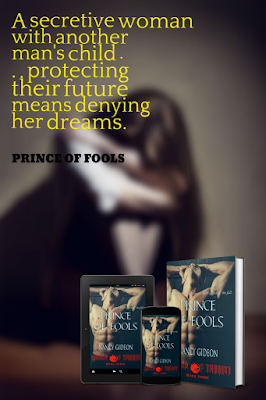 But Amber doesn’t realize what lengths her prince will take to protect her and that future he sees for the three of them together in PRINCE OF FOOLS, Book 3 in my “House of Terriot” spin-off of my “By Moonlight” series (now wrapping up with my current WIP!). I’m taking two weekends off before sharing the final “House of Terriot” book, PRINCE OF DREAMS to promo a special $.99 sale from April 16 to 30 on two very different (and not just because of my pen names!) books – LIFETIME INVESTMENT, a contemporary romance written as Dana Ransom and MIDNIGHT SHADOWS, part of my Nancy Gideon “Touched by Midnight” vampire series. Looking forward to reintroducing you to them! Finally – SPRING! Windows open, birds chirping and even took my sister’s old dog for a long walk so he could leave p-mail on every bush and tree. Will have to go check replies soon now that sidewalks are free of ice and snow! Happy driving with windows down and Happy Writing, Fellow Warriors!! Oh gosh! She in quite the dangerous situation. Such an intriguing snippet! Thanks, Jessica!! Yes, she is. I bet I know what she's planning and it isn't good. Push Rico away, break his heart, and he won't want anything to do with her so she can leave. Will it work is the question! I'm going to go charge my Kindle and buy this now! Thanks, Jenna! Will it work? Maybe with the old Rico . . . but now? I'm not so sure. I won't get in your way - click away! The sense of fear and urgency here was so intense it was hard to catch my breath! Really a well done snippet, grabs the reader and doesn't let go. Nothing like a protective mother on full alert! Especially one already on the run. Wow, that last line...powerful stuff! Your writing is so gripping and chock-full of emotion, Nancy! I'm envious! (Blush!) Thanks, Julie! But you have nothing to be envious of! I wish she hadn't dismissed going to Rico so quickly, but your description of her survivor's instincts was very convincing. She's used to taking care of herself and will continue to do so. She's in pure fight or flight mode, and since it's a fight she can't win, running is the only way she knows how to safe those she loves . . . including him. Great snippet. You do a good job conveying her sense of urgency as well as hinting at what she's about to lose. Thanks, Ed. Then my job is done! Oh, yeah, in a BIG way! Great song choice for the snippet! The feeling of losing everything just when it seems that maybe things are getting better is so painful. The hunt for the right music is as fun as the search for the right words! Survivor instincts seem to be ruling the moment with urgency. Great scene. And she's the ultimate survivor. "...now that sidewalks are free of ice and snow!" You did it! You jinxed us. 5" snow yesterday. Thanks, Nancy. My heart aches for Amber. She's so torn. She'll sacrifice her love to save Rico. Bet nobody's done that before. Great snippet, Nancy. Yes, it was ALL me. I couldn't wait until next winter to push snow off my car again. And no, no one has gone that extra mile for Rico. It's all new for both of them. I'm curious to know how she plans to manipulate him into not following. Enjoyed this! She has a plan . . . not a very good one, but a plan that almost works. Don't be so sure. . .